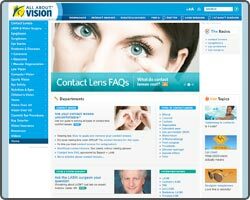 Ortho-K is a non-surgical process which reshapes (flattens) the cornea of the eye using contact lenses. 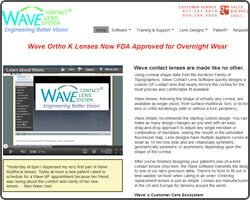 Accelerated Ortho-K uses reverse geometry contact lenses. Flattening the cornea reduces the focusing power of the eye. If the amount of corneal flattening is accurately controlled, it is possible to bring the eye into correct focus and compensate for myopia (nearsightedness). 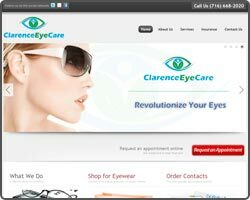 Our philosophy is to provide thorough eye exams on all of our patients age 4 and up and check for cataracts and glaucoma using the most current and advanced techniques available. We have a beautiful, newly remodeled office and optical boutique with new frames, priced for every budget, and we still provide repairs free of charge for most problems. Wave Design software has been in use since 1999. Our first month of operation saw the production of 36 lenses. Today we produce 1000’s every month from two labs in the US and one in the United Kingdom. From the original handful of providers, we now have over 300 in the US, Canada, Europe, Asia and Central America ordering lenses from Wave. 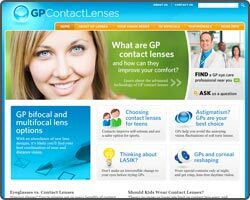 Founded in 1985, GPLI provides education to consumers and eye care practitioners to enable them to fully benefit from the many advantages of GP contact lenses. GPLI supports eye doctors, other contact lens practitioners and optometry students with workshop programs, online symposia and an array of educational materials. 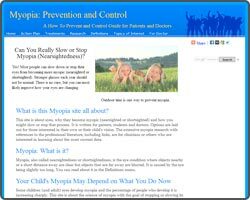 Myopia Prevention is a site about eyes, why they become myopic (nearsighted or shortsighted) and how you might slow or stop that process. It is written for parents, students and doctors. Options are laid out for those interested in their own or their child’s vision. The extensive myopia research with references to the professional literature, including links, are for clinicians or others who are interested in learning about the most current data. 670 million people worldwide are blind or visually impaired simply because they don’t have access to an eye exam and eyeglasses. All About Vision is a Gold National Sponsor of the efforts of Optometry Giving Sight to eliminate avoidable blindness due to uncorrected refractive error.